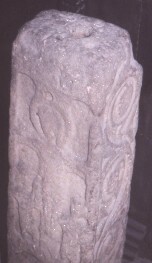 Central part of Cross shaft, dated to the mid eighth century, showing the front, side and top. The front has a crucifixion scene. There is a broad horizontal band at the top and at the bottom of this panel. The cross extends to the top and bottom within the frame. Christ stands with his feet out-turned and his arms extended. His head is turned to his right and he has a small halo. He seems to be wearing a straight knee-length robe. Below Christ there are two smaller frontal figures. The figure on the left is driving a spear into Christ's right side. The figure on the right seems to be holding a cup or a sponge. Both figures are wearing long straight tunics. The side of the shaft has four volutes of a simple scroll. The top of the shaft shows a dowel-hole.